Radisson Blu Waterfront Hotel in St Helier, Jersey, has extensive views of Jersey's Elizabeth Marina, Elizabeth Castle and St. Aubin's Bay. 10 minute walk St Helier town centre. Generous sized standard rooms, business class rooms and luxury suites with seaviews with Wi-Fi. Accessible rooms with walk in shower or low level bath and interconnecting family rooms are available. 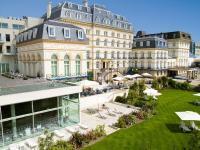 Pomme d'Or is a famous 4 star hotel in the centre of St Helier, Jersey. Overlooking Liberation Square & yacht marina, Pomme d'Or Hotel is 200 metres from St Helier's main attractions. The hotel combines traditions of great hospitality with a contemporary design in a superb location. The 143 bedrooms have the facilities you'd expect of a 4 star hotel, such as free Wi-Fi.